The Toa Mahri of Water is in her element in the depths of the ocean! Her six wing-like fins let her swim faster than anything underwater and her Mask of Kindred lets her mimic the powers of other sea creatures. 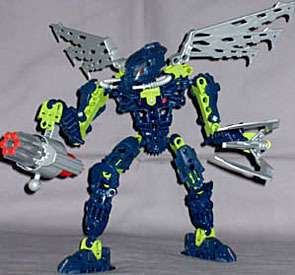 Carrying a Cordak blaster and protosteel talons, Hahli is the true power in the sea. So she's basically Aquagirl, but since 2007's Bionicle range was all set underwater, that's not as bad as it might seem, since she doesn't have to go through Aquaman's embarrassing routine of having to somehow get criminals to go for a swim before he can defeat them. All the other Toa used to laugh at Hahli back on dry land, when every battle would begin with her activating her mask and suffocating until she switched it off again, but now the fin's on the other foot. Random idiocy aside (serious-minded OAFEnet readers should know by now to skip my opening paragraphs), Hahli is a pretty good example of the standard Toa of 2007. 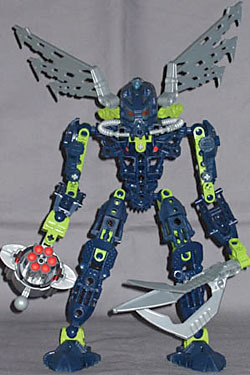 Unlike the Barraki, who are a bunch of monster freaks, Hahli is pure modern-Bionicle, and even with her breathing-helmet mask she could happily stand alongside the Toa of Phantoka and Mistika, or even pass for a slightly eccentric water Glatorian from 2009's range. As such she's got exactly the standard articulation set, with balljoints at the neck, shoulders, elbows, wrists, hips, knees, and ankles, although her wings are mounted on extra balljoints on her back. On the plus side, she looks the part. Deep blue is her colour, with a careful sprinkling of green - too much would muck up her ocean look, but wisely the major green parts, the biceps and thighs, are largely covered by blue armour pieces attached to them, getting the balance of base colour and highlight just right. The torso doesn't have any chest armour attached - maybe she's skinny-dipping? - which makes her look somewhat leggy, with the heavy knee-plated shin pieces and wide feet used. Her mask is a rather complex affair, with an inner element to give it transparent eye shields, a blue spotlight above the forehead, and twin oxygen tubes - actually one tube that loops around through a sleeve behind her neck. Unfortunately there are a couple of issues with the mask and head in general. Hahli's head uses the larger eye-piece, with a little "crest" sticking out the back, and that and the wing unit means that she can't crane her head back very far - say, in a swimming pose. Bit of an oversight there, for the Toa of Water. Also, the breathing tube is ribbed, meaning it won't slide smoothly through the sleeve it fits into behind her neck, so when you turn her head, you'll need to manually adjust the tube to keep it from pulling tight on one side. Combat-wise, Hahli's got her crazy protosteel claw, which looks nice and capable of gutting any Barraki who gets anywhere near her. Being a Toa Mahri she also had a Cordak blaster, an air-pressure-powered rotary cannon, which ranks as one of the more complex weapons the Bionicle range has yet produced. Held by the two fins either side of the body of the weapon, you push in the red pump unit at the rear, producing the pressure which sends the light rubber dart flying out - it's not heavy enough to do any damage, or even knock a toy over unless it was teetering to begin with, but at least it looks good. Even better, as the pump retracts, internal gearing rotates the next barrel into position for firing. After a moment's practice, you'll have no trouble slamming out all six shots in rapid fire - beats the hell out of the Barraki's lame squid launcher. Unfortunately, for all its solid engineering as a weapon, the Cordak doesn't have the best mounting points for its owner to hold it - with a Technic port high on top, and the firing fins making the weapon wide rather than tall, it doesn't look really natural held in Hahli's "hand," and unlike the Nynrah and Midak blasters that followed in 2008, there aren't any additional ports to allow her to wield it two-handed, which generally looks better. Besides the six darts the Cordak stores in a full magazine, Hahli comes with three extras, which can be stowed in ports between her wings. All in all, Hahli could've been better - she's got a few niggling flaws, like the neck joint and Cordak mounting, that keep her from being really good. On the plus side, pose her right and she looks great, with her elaborate wings spread out above her - of the three Toa Mahri I've found (more on the other two soon), Hahli is definitely the most visually impressive.